GERZ Matratzen was founded in 1987 by Eduard Gerzoskovitz and based in Fürth Bislohe. In 1990 the legal form of the company changed to a limited liability company, today’s GERZ Matratzen GmbH. In 1997 the company moved their office from Fürth Bislohe to Langenzenn. 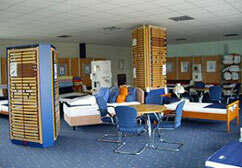 The GERZ Matratzen GmbH is an innovative manufacturer of mattresses based in Langezenn. In addition to mattresses our range of products also includes beds, bed accessories and bed frames. Our customers benefit from our ability to offer individually customized products. As a smaller company we have short chains of command and are therefore able to react immediately to queries, change requests or changes in the supply process.